Silverton 48 Convertible: A big battlewagon with style and substance. The new flagship of the Silverton fleet — the 48 Convertible — has arrived to play in the same league as the well-known heavy hitters of the sportfishing yacht world. 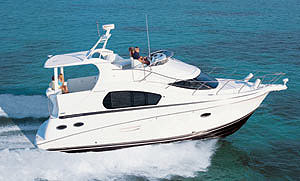 There's no mistaking this boat for anything else but a serious sportfisher: Its commanding appearance is all business. However, the new Silverton 48 Convertible is much more than a fishing machine. Inside, you'll find all the comforts and conveniences of a motoryacht, executed in a style unlike any other boat this New Jersey-based builder has ever produced. 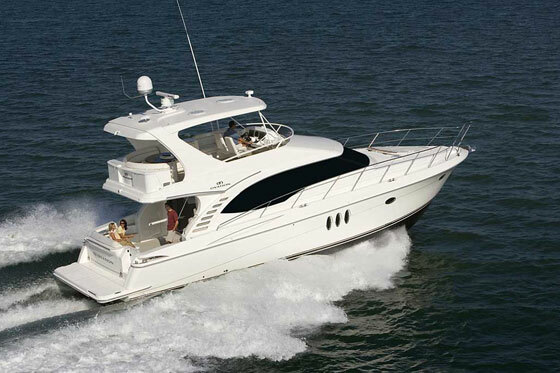 The 48 Convertible's sleek 51-foot, 6-inch hull has a 16-foot, 3-inch beam, providing abundant space for three staterooms, two heads, a spacious saloon with a galley on the same level, a large fishing-ready cockpit and arguably the largest flybridge in its class. The 48 Convertible is equally adept at fishing and cruising. Silverton has been building convertibles for several decades. The new 48 is the biggest and quite possibly the best of the company's rugged and reliable line. When equipped with the optional Fish Pack sportfishing amenities package, it can chase down the biggest catches, wherever they may be found. The essentials include rod holders, a livewell in the transom, rocket launchers above and a fighting chair mounting plate molded into the cockpit sole. There's a bait station and plenty of rod storage, too — not to mention an optional ice-maker. 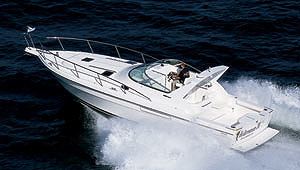 The 48 Convertible is a heavy boat, weighing in at well over 50,000 pounds when fully loaded. That's because of a hefty lamination schedule and a solidly built hull. The structure starts with seven layers of 2415-stitched Fabmat, bonded together with a 1.5-ounce application of chop strand and 15 mils of Hydropel in the bottom. This beefy construction process produces a hull with the solid ride of a heavy boat, no matter what the conditions may be. With all this mass, the 48 handles responsively and is remarkably nimble. It comes equipped with power steering as a standard feature. What impressed us most was that helm response is nearly instantaneous, regardless of speed. While cruising, turning the wheel provokes an immediate and accurate response. At idle speed, there's no waiting. The boat heeds the wheel almost as quickly. The only lag in response that we noticed was when we turned the 48 in its own boat length, with one engine forward and one in reverse. There was a bit of delay as the props got a bite of the water — but once they did, the boat pirouetted nicely. This was likely because of the prop tunnels. They're not deep pockets, but are built-in to keep the boat's draft at less than 4 feet. The 48 Convertible's Donald Blount-designed hull performs well on open water. It has a deep forefoot with a pair of strakes on either side to direct spray outward, and 12.5 degrees of deadrise at the transom. Our test boat had a pair of electronically controlled 825 hp MTU Series 60 diesels — the largest engine package available. They moved the 48 Convertible along smoothly and quickly. The boat cruises comfortably at 29 knots and will hit a top speed of just over 33 knots. 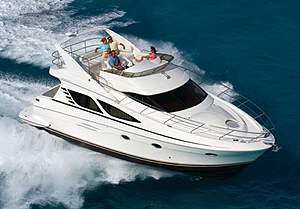 The best fuel economy is at around 21 knots, where the engines turn a leisurely 1,800 rpm. Where the exterior of the 48 Convertible is serious substance, the interior is sumptuous style. The Silverton designers realized that when you play in the big leagues, buyers have certain expectations. The accoutrements and attention to detail in this boat are a level above anything the company has offered before. Noted interior designer Theresa De Ponceau created an exquisite d?cor. The warm feel of cherry wood is the continuing theme throughout the cabin space. It is complemented by sculptured pile carpeting. Several choices of soft goods and fabrics are available as accents. The main saloon's overhead is artfully focused on a circular light fixture at its center and has contrasting fabric panels radiating outward. The 48's size means that there was no need to compromise when arranging the ample saloon seating. Abaft the galley, there's an L-shaped Ultraleather lounge. The section that faces the bow is an incliner. In the long side, you have the option of either a hideaway berth or a storage compartment that is capable of holding an arsenal of 7-foot fishing rods. A dining area is located forward and to starboard, opposite the galley. Don't call this a "dinette:" You get a real dining table here. In the galley, you'll find top-of-the-line appliances, including separate Sub-Zero refrigerator and freezer (with ice-maker) units built in under the Corian countertop. There's a three-burner Princess electric range, a microwave/convection oven and coffee-maker — all as standard equipment. A trash compactor is optional. There's abundant storage space both above and below the counter. The upper cabinets extend along the side and nearly two-thirds of the way across the windshield length. A hatch in the galley sole not only allows access to mechanical spaces, but it also has two rollout wire baskets for storing other supplies. A 27-inch JVC flat-screen television is a standard feature in the main saloon. You have the option of locating it either in cabinet space to starboard of the entrance from the cockpit, just below the master electrical panel; or in an extension of the galley cabinetry along the windshield area. Eliminating this section of glass does cut down the view to the outside, but it also blocks a considerable amount of sunlight that would otherwise heat up the cabin. The choice is yours. The central element of the amidships master suite is a queen-size berth with an innerspring mattress that is accessible from three sides. There's storage in the base — including a cedar-lined locker under the mattress, as well as drawers at the foot of the berth. Another feature we appreciated here is the optional flat-screen TV that folds down from the ceiling for bedtime viewing. There's also an en suite head with a separate shower stall. The guest suite, located in the bow, also has a queen-size berth and a generous amount of storage space. It has its own entrance to the second head, which also has an enclosed shower stall. The third stateroom is located to starboard, at the foot of the companionway stairs leading from the saloon. It offers a pair of bunk-style berths and a large hanging locker, and it has comfortable stand-up room for dressing. Cruisers will appreciate the 48 Convertible's standard washer and dryer combo. You won't have to search out a coin laundry when you reach your next port. Flybridge space on the 48 Convertible is remarkable. There's a large seating area forward, complete with a countertop for mixing and serving refreshments from an optional refrigerator. 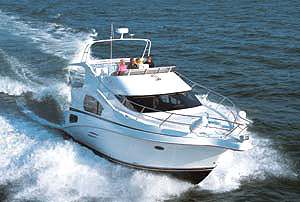 The helm has a generous amount of room for electronics and a pair of comfortable captain's chairs. The space is covered by a hardtop — which is standard — and your choice of side enclosure options. Air conditioning is an available option. If you ever need to work on the helm electronics from behind the console, there's plenty of room to do it while sitting upright inside the helm console. I've seen spaces this size called a "third stateroom" on some boats. With ample size for luxurious accommodations and a capable design for serious sportfishing, Silverton's new 48 Convertible has what it takes to compete with the "big boys" of the midsize-to-large sportfisher field. 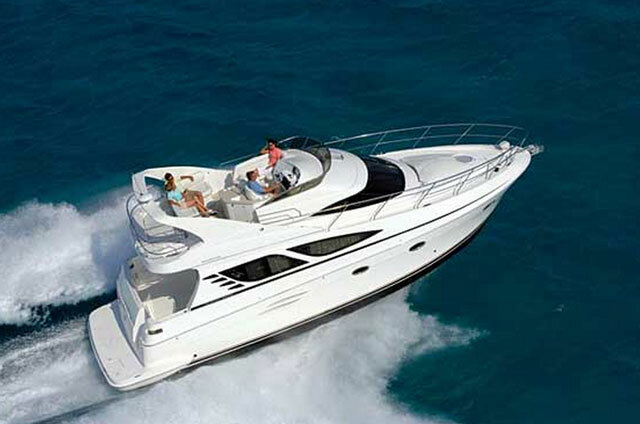 The 48 also comes with an attractive price tag, when compared to those big-name sportfishers. The base-priced 48 Convertible with twin Volvo Penta engines starts at $731,430 — not $1 million-plus. Sub-Zero refrigerator and freezer units; innerspring mattresses in staterooms; Oil XchangeR oil-changing system; 13.5 kw auxiliary generator with sound shield; four-zone interior air conditioning; VacuFlush heads; electronic engine controls; flybridge hardtop. 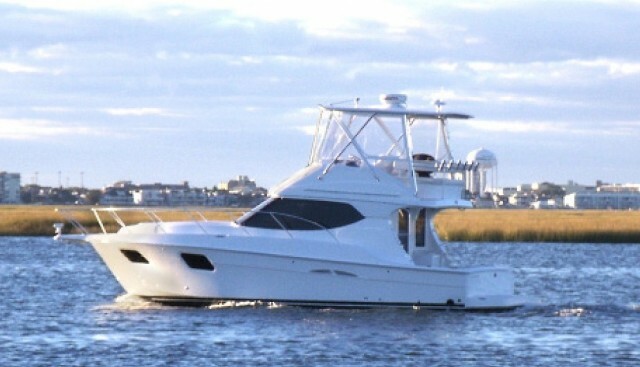 Two-burner electric grill in cockpit; flybridge air conditioning; flybridge side enclosure; swim platform with ladder; windlass; Fish Pack sportfishing package; foredeck davit. 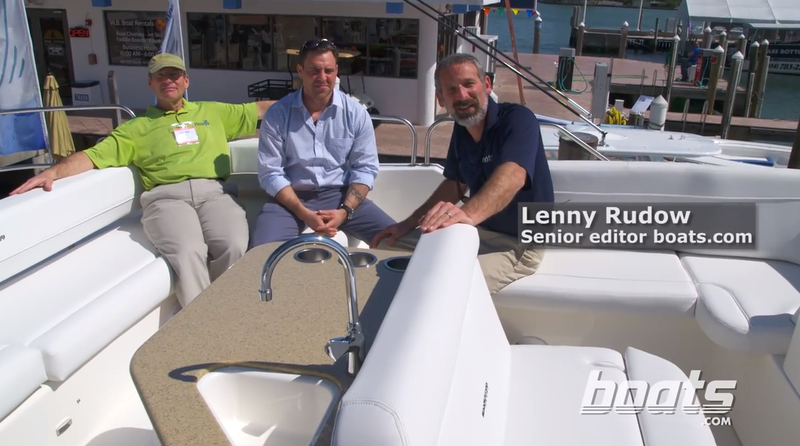 Hull features a solid fiberglass bottom using seven plies of 2415-stitched Fabmat; 2-mm Coremat and two-ply stitched Fabmat is used on sides. Gelcoat is 25 mil thick on bottom; 22 mil thick on sides.